This box makes a wonderful gift box or would grace any dressing table. Kit contains: 14-count stitching paper, backing card, stranded cotton, needle, chart and full instructions. 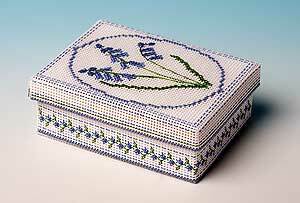 This box, measuring 4 cms high, 8.3 cms wide and 11 cms long, is a matching piece for our Bluebells greetings card. It is stitched on white perforated paper and lined with dark blue card.